Bring your fabulous catalog design into your store! Engaging. Reinforcing. Consistent. Instant Recognition. In-Store catalog support gives a rich appearance for your brand, enhances your identity, and reminds your customers to watch their mailboxes! 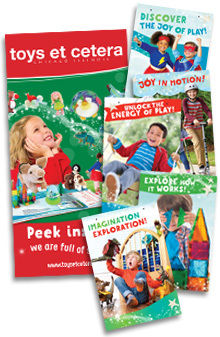 We offer marketing support for in-store use including banners and posters that complement the design of the catalog. Blend your catalog design into your store design. We hung them from the ceiling and I loved the professional look and how it reinforced our catalog. The banner is hung in my store and adds some brightness and cheer. Do yourself a favor and call the office right now and ask them to send you one! You won't be sorry! We hung two of the bold colored banners in the front window and then loaded the window up with Catalog products! One of our senior staff member said when she came in today- the window looked like a Big-City Window and it made her really excited to have catalog shoppers start coming in! Our mission statement: To unite and support the best independent toy stores in a member-owned cooperative venture to thrive and compete by promoting creative, culturally-sensitive, quality playthings that foster happy, healthy childhoods and productive lives. The Good Toy Group creates catalogs for our independently owned toy stores across the country that focus on quality toys for children of all ages. We have over 85 toy stores and 145 locations across the country. Each store owner is independent, knowledgeable and committed to making the best toys available to children. © 2019 Specialty Toys Network, © 2019 The Good Toy Group or its affiliates. All Rights Reserved.